Nutrients have been amongst major observational variables in various international global ocean observation expeditions, such as the Geochemical Ocean Sections Study (GEOSECS) in the 1970s, the World Ocean Circulation Experiment (WOCE) in the 1990s, and the on-going Climate Variability and Predictability (CLIVAR). Observation of the natural variability of nutrients in the world’s oceans, and investigation of temporal and spatial changes due to the oceans’ response to climate change and increasing carbon dioxide in the atmosphere, continue to be important topics of oceanographic research. 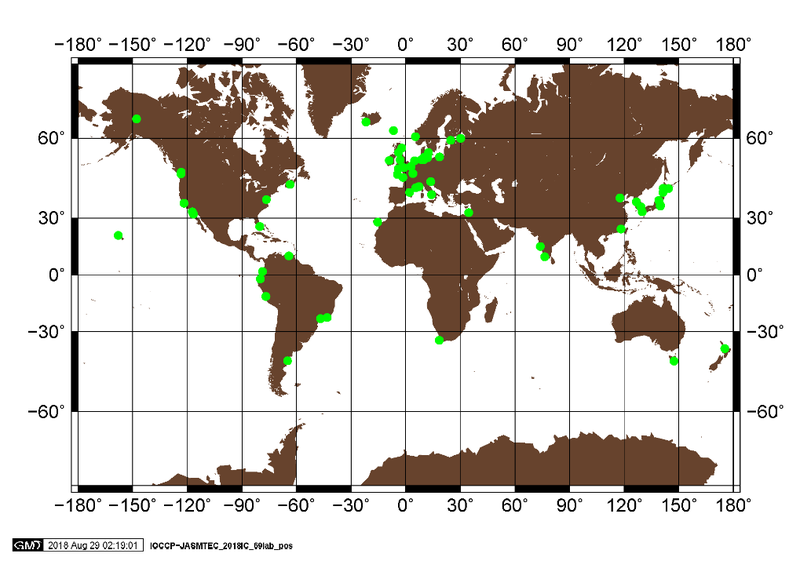 Therefore, the comparability and traceability of nutrient data in the world’s oceans are fundamental issues in marine science, particularly for studies of global climate change. Since 1965 numerous inter-laboratory comparison studies that have been carried out to improve comparability of nutrients data in the world oceans (UNESCO, 1965, 1967; ICES 1967, 1977; Kirkwood, 1991, Aminot et al., 1995; Topping, 1997; Willie and Clancy, 2000; Clancy and Willie, 2003; Aoyama et al., 2006, 2008, 2010, 2013). However, no globally approved consensus has been achieved to date. The 4th IPCC Assessment Report in 2007 highlighted this problem inherent in comparing existing data sets: "Uncertainties in deep ocean nutrient observations may be responsible for the lack of coherence in the nutrient changes. Sources of inaccuracy include the limited number of observations and the lack of compatibility between measurements from different laboratories at different times” (Bindoff et al., 2007). To guarantee comparability of data from different laboratories and from different research cruises, globally accepted research methods (RMs) and certified reference materials (CRMs) for nutrients' measurements are being developed and IOCCP plays an active role in these efforts. International collaboration and action is now required to harmonize oceanic nutrient data using globally accepted RMs/CRMs. Particularly important issues for the study of changes in properties of deep water masses is to develop a system by which the data within laboratories and between laboratories is comparable at the 0.1 % level. This should be both within individual cruises and extend to allowing comparison between cruises separated by decades. The IOCCP in strong collaboration with institutional and programmatic partners worldwide is going to work towards the development of such system to harmonize global oceanic nutrients analysis. We are excited to announce the publication of the IOCCP-JAMSTEC 2018 Inter-laboratory Comparison Exercise of a Certified Reference Material (CRM) for Nutrients in Seawater. We would like to congratulate Prof. Michio Aoyama and the team for leading the activity, and the 69 laboratories that participated in this 6th intercomparison exercise. It is heartening to see that most of these laboratories are able to analyse nutrients concentration within the certified uncertainty of the unknowns provided. The recommendations included in this report provide guidance for increasing the ability of the global community to answer questions about the changing marine macronutrient environment. For more information about the activity, please see the abstract below and access the full report in PDF above. In 2017, IOCCP and JAMSTEC decided to conduct the 6th International Inter-Calibration Exercise of a Certified Reference Material of Nutrients in Seawater. As was the case with the previous four inter-comparison (IC) studies organised by MRI-JMA and the previous IOCCP-JAMSTEC IC exercise in 2015, the aim of the IC exercise was to improve the level of comparability by exchanging knowledge among participating laboratories. The scale of the study was expanded so that 107 laboratories in 33 countries received a letter of invitation to the IC exercise. 71 laboratories in 30 countries agreed to participate, and ultimately 69 laboratories from 30 countries returned their results. The data were statistically analysed, and the results described in the report. The agreement between consensus median/mean and certified values was within uncertainty for all five samples used in this IC exercise. Only small discrepancies existed among core laboratories the reported close-to-consensus values and certified values. The results of the study indicate that comparability of nitrate and phosphate analysis among the laboratories has gradually improved from 2008 to 2018, however, comparability of silicate analysis among the participating laboratories has not changed during these years. The results of this IC exercise also showed that nonlinearity of the calibration curves for the nutrient analysis in each laboratory is still a significant source of reduced comparability of nutrient data. It was concluded that to maintain comparability of results there is a need for wider use of nutrient CRMs, concentrations of which cover the whole range of nutrient concentrations in the world's ocean. The results of this IC exercise imply that the majority of the participating laboratories are very capable of measuring nutrient concentrations in seawater, and using CRMs will further increase the comparability of results. The results may be SI traceable in the near future. Please see the full report for more information. If you have any questions, please direct them to Prof. Michio Aoyama, who is the coordinator of the IOCCP-JAMSTEC 2018 IC exercise, and IOCCP SSG responsible for the Nutrients theme. Information on results from previous inter-comparison studies as well as other relevant background reading can be accessed via various links at the bottom of this page. Global map showing the distribution of 69 laboratories from 30 countries/territories participating in the IOCCP-JAMSTEC 2018 Inter-laboratory Calibration Exercise of a Certified Reference Material of Nutrients in Seawater. 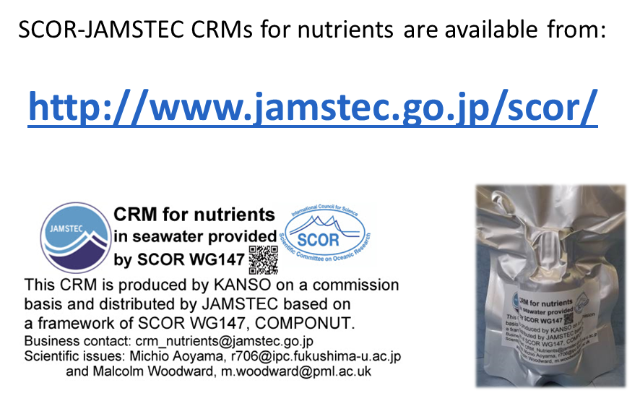 The SCOR WG 147, through JAMSTEC, are providing a series of CRMs for nutrients in seawater (see labels and bottle above), with a new cost structure making them more accessible and affordable for the global science and research community. More information about the SCOR-JAMSTEC CRMs can be found HERE or on the JAMSTEC website. Aoyama M, et al. (2016). Comparability of oceanic nutrient data. Poster Cluster Community Whitepaper presented to the 2016 CLIVAR Open Science Conference "Charting the course for climate and ocean research"
Hydes D, Aoyama M, Aminot Alain, Bakker K, Becker S, Coverly S, Daniel Anne, Dickson A, Grosso O, Kerouel Roger, Van Ooijen J, Sato K, Tanhua T, Woodward M, Zhang J (2010). Determination of dissolved nutrients (N, P, Si) in seawater with high precision and inter-comparability using gas-segmented continuous flow analysers. In The GO-SHIP Repeat Hydrography Manual: A Collection of Expert Reports and guidelines. IOCCP Report No 14, ICPO Publication Series No. 134, version 1, 2010 (UNESCO/IOC). Note: The GO-SHIP Manual is currently undergoing revision. Public consultation of the Nutrients chapter draft will be announced as soon as the draft is available. Guideline of Ocean Observations. Volumes 1-10, 3rd edition, The Oceanographic Society of Japan, April 2018. M. Aoyama, K. Bakker, J. van Ooijen, S. Ossebaar, E.M.S. Woodward (2015). Report from an International Nutrient Workshop focusing on Phosphate Analysis, 2015, Yang Yang Publisher, Fukushima, Japan. Gordon LI, Jennings JC Jr., Ross AA, Krest JM (1993). A Suggested Protocol for Continuous Flow Automated Analysis of Seawater Nutrients (Phosphate, Nitrate, Nitrite and Silicic Acid) in the WOCE Hydrographic Program and the Joint Global Ocean Fluxes Study. Oregon State University College of Oceanography Descriptive Chemical Oceanography Group Technical Report 93-1, WOCE Hydrographic Program Office, Methods Manual WHPO 91-1. GEOTRACES Cookbook: Sampling and Sample-handling Protocols for GEOTRACES Cruises. Edited by the 2013 GEOTRACES Standards and Intercalibration Committee. Version 2.0, December 2014.